This article is a short summary of Super Mario Galaxy. Super Mario Galaxy (known as Super Mario Wii: Galaxy Adventure in Korea) is a 3D Super Mario platforming game released for the Wii in 2007. The game is based on the sphere walking aspect of the Super Mario 128 demo, developed by the Tokyo division of Nintendo EAD. Super Mario Galaxy has sold over 12 million copies worldwide. The game would also receive a sequel, Super Mario Galaxy 2, released in 2010 for Wii. A Mario adventure of cosmic proportions! Shake and point your way across alien worlds! Get a friend to help! With a second Wii Remote, another player can jump in at any time to help grab Star Bits, fire them at enemies, and sweep aside incoming attacks. He'll constantly collect bits of stardust - these can be fired at enemies using the B Button. A second player can even take on this role, using a second Wii Remote to stall enemies, fire stardust, or even sweep aside projectiles. Become Mario as he traverses gravity-bending galaxies, traveling in and out of gravitational fields by blasting from planet to planet. Control Mario with the Wii Remote™ and Nunchuk™. Power-up to reach inaccessible areas. Collect Star Bits to either stun enemies or feed Lumas. It is the night of the Star Festival, an event that occurs every 100 years where a comet passes over and drops stardust onto the world. Princess Peach has invited Mario to her castle to celebrate and give him a present. However, when Mario arrives, the castle and town come under attack from Bowser and his airships, which, with the help of a UFO, rip the castle out of the ground and carry it off into space, heading toward the center of the universe. Kamek knocks Mario off the castle and into space. Mario wakes up on a small planet, where he meets a group of Lumas as well as their mother, Rosalina. Rosalina explains that Bowser has stolen the Power Stars that power her ship, the Comet Obseratory, and that if Mario is able to retrieve them, she can take him to the center of the universe. 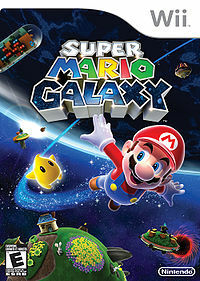 The gameplay of Super Mario Galaxy is similar to previous 3D Super Mario games. From the Comet Observatory, players can enter one of several domes, which allow access to a set of galaxies. Each galaxy features a set of missions to earn Power Stars, with the final galaxy in each dome being a boss galaxy where the player can earn a Grand Star, allowing access to a new dome. Each galaxy also has a new type of mission known as a Prankster Comet, in which the player must complete a given mission or existing objective with an added condition, such as having one hit point or being given a time limit. Each galaxy in a dome that is not the first requires a certain number of Power Stars to unlock. Most galaxies are composed of planetoids that Mario can move around, using Launch Stars to travel between them. Among the new moves available in this game is the Spin, performed by shaking the Wii Remote. The move allows Mario to attack ground enemies and gives him extra jump height. The player is also given an on-screen cursor by pointing the Wii Remote at the screen and moving it, which can be used to pick up Star Bits and shoot them. Mario's life meter has also been decreased to only three units, which can be doubled using a Life Mushroom. The game features a cooperative multiplayer mode titled Co-Star Mode, which allows a second player to control another cursor. The second player can pick up and fire Star Bits, and when their cursor is lined up on Mario pressing A allows him to perform a Co-Star Super Jump. KOR: April 23, 2015 A re-release of the game under the Nintendo Selects branding. AUS: February 5, 2016 A direct port of Super Mario Galaxy released as a digital download on the Nintendo eShop for Wii U. A mixup involving GameStop's automated messaging system resulted in the message erroneously telling those who pre-ordered the game that Super Mario Galaxy was an M-rated game. This page was last edited on 1 November 2018, at 10:45.